KISS bassist Gene Simmons was featured on this past week’s episode of Toy Hunter, a reality series airing on The Travel Channel. 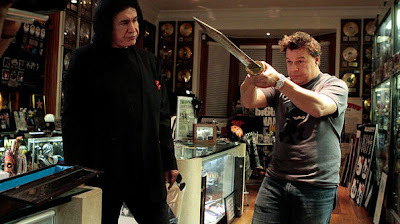 Simmons contacts program host and toy dealer Jordan Hembrough to have him search for some rare KISS memorabilia. The first video shows Jordan at a flea market hunting for KISS goodies, while the second has the host arriving at Gene’s house with the results.